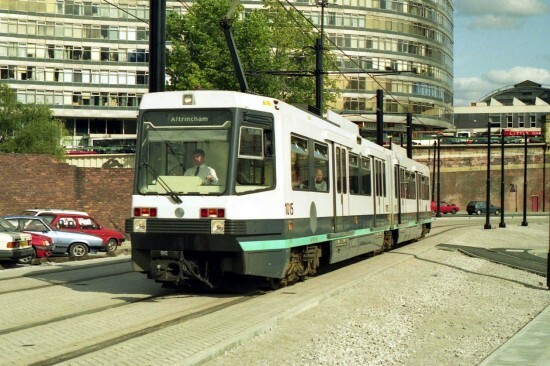 The fifteenth of the T68s to be built for Manchester Metrolink is the latest tram to feature in our Picture in Time series. We take a brief look at the history of 1015 accompanied with an image from August 1992. 1015 is the only T68 to have ever carried three distinctly different liveries (ignoring the different varieties of the white and turquoise original Metrolink colours) and was delivered to Manchester on 27th March – the last of the 26 strong class to arrive in the northwest. It was soon used as a parts donor and did not actually enter service until 2nd July 1992. It spent eight years in service without much of note happening until it was moved into the workshops to become one of three T68s modified to be used on the Eccles line in 2000. In 2004 1015 received a vinyl wrap advert – the first on Metrolink – for the “Get Our Metrolink Back on Track” campaign with this being carried between September of that year and March 2005. Another livery change followed in 2010 along with a number change, although this was not to ever see service as it was all to do with the high profile Coronation Street tram crash. 1015 has also been a fairly unlucky tram with two RTCs and two derailments recorded. It also went to Wolverton Works for refurbishment in 2005 and had further attention in the Metrolink workshops in 2010 under the T68X Universal Running project. Withdrawal came on 20th September 2012 and was sent for scrap on 24th July 2014. This photo shows 1015 having just left Piccadilly on 25th August 1992. The surroundings the tram is travelling through have changed beyond recognition in the intervening period. This entry was posted in Manchester Metrolink, Picture in Time. Bookmark the permalink.